8,124 miles. 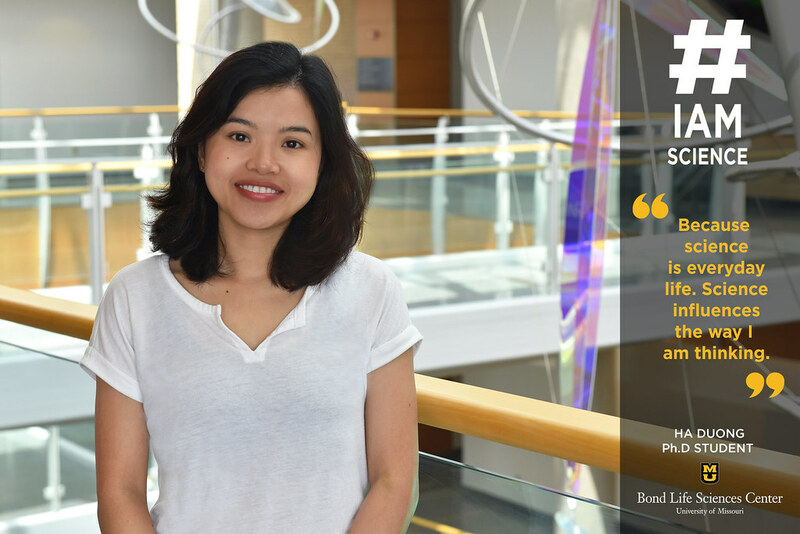 That’s how far Ph.D. student Ha Duong traveled from home to work in the Stacey Lab at Bond LSC. Duong came from her home in Vietnam where she studied plant sciences at Hanoi University of Agriculture. A chance encounter brought her to MU. With some questionable looks from her mother when she first heard of the idea, Duong went for it anyways. Despite a significant culture change from Vietnam to Missouri, Duong is embracing the change as an opportunity to get to know herself better. Duong’s love of science stems from hanging out in her father’s material physics lab growing up. Duong did not realize the impact this would have on her until looking back on all the times of being in his lab. Years later, Duong is now going into her fifth year as a Ph.D. student. She is trying to find the missing components in the extracellular ATP signaling pathway in plants. ATP is a high-energy molecule typically found inside cells where it stores and supplies the plant with fuel, so it is somewhat surprising that it also has a signaling role outside of the cell. The Stacey Lab discovered the first extracellular ATP receptor in plants, so now the research is digging more into their discovery. Duong is happy about being around pioneers in plant science and wishes to be a pioneer as well. To Duong, science can be applied from the lab to her home. However, Duong emphasizes that science isn’t always as serious as one thinks. She has flexibility and creativity when it comes to her work and being half the equator away from home while studying what she loves makes missing home a little easier.